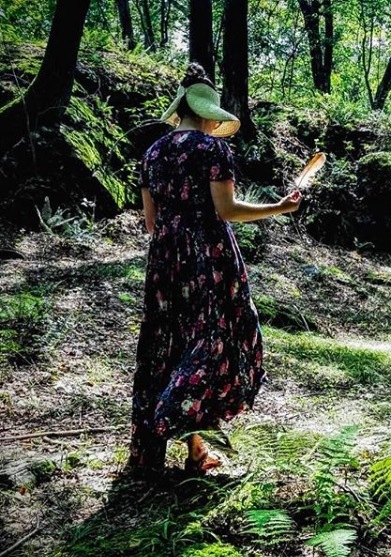 When I was little, not little-little, but, tomboy little, 8 or 9 maybe, around this time every year, as soon as it started to get warm enough outside, I’d start going around barefoot. Little by little, short bursts to get the mail, into the backyard (carefully avoiding the deep bed of prickers fallen around the holly trees), across the driveway, ours smooth black asphalt, working up to our dear neighbors ohmygod EXPOSED AGGREGATE the ultimate bane of bare feet. The first liberation of winter white little toes, carpet-soft heretofore be-slippered paws that had been swaddled in socks and winter boots for months. I called it “getting my summer feet”, my 8 year old notion that if I started getting the bottom of my feet prepped in April, by the time June rolled around I’d have leathery indian feet, ready to go in the woods, play kickball on pavement, traverse hot sands, climb seaside and riverdeep rocks, go clamming, and repel splinters and blackberry thorns with ease. 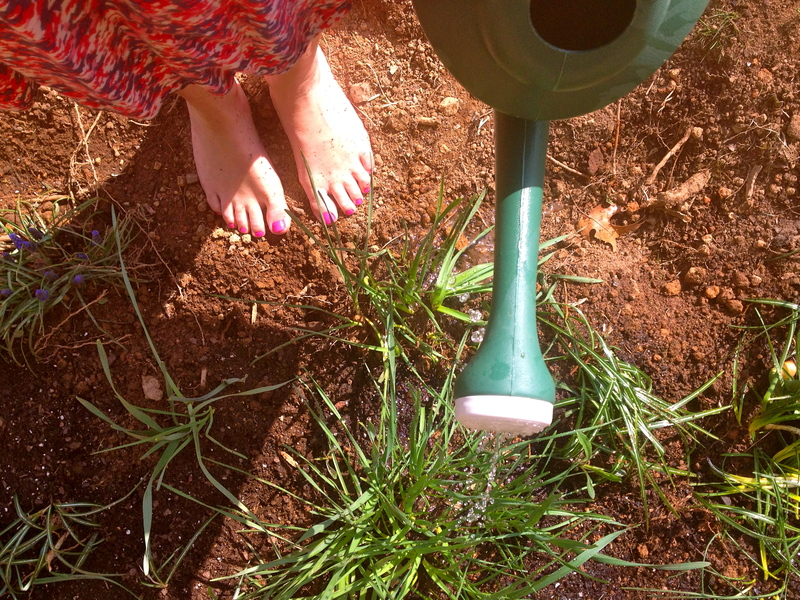 Today is the first day it’s been warm enough to go outside barefoot, and as I stepped outside to water our newly transplanted bulbs and yet to sprout seedlings, I thought: Ouch. It’s been YEARS since I’ve let my feet loose from their high-heeled-and-pedicured-city-street-subway-stair-walking duties. YEARS since I had summer feet. And then I thought: YES! The countrification of these feet begin today! 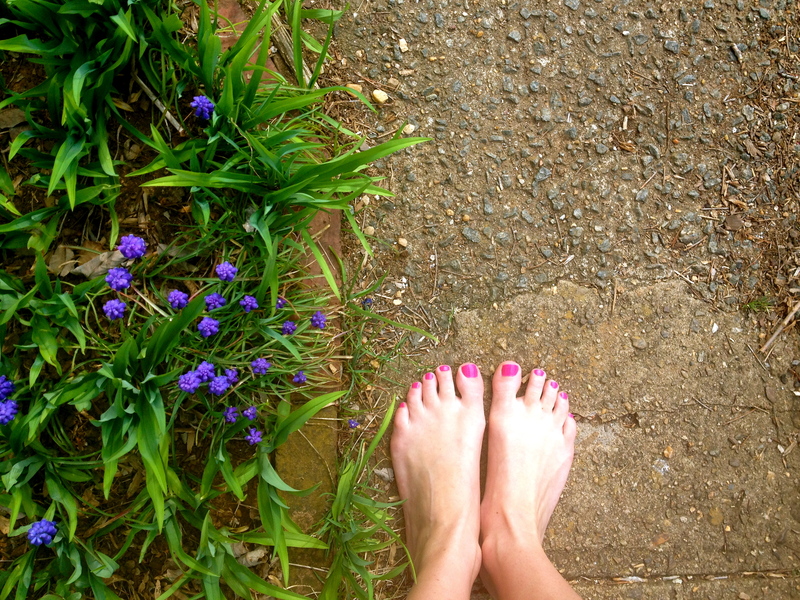 Summer feet: 20 years later, now with hot pink nail polish. I really enjoyed your post. It is nice to have our feet out of tall boots! City Feet to Country Feet. Spring Feet to Summer Feet. No matter where or when, always and always, Sweet Feet! I remember many summers spent barefoot on the farm, and mom would try so desperately to make me keep my shoes on at church. When the sun is shining and the grass is green, though, shoes just aren’t that appealing! Thanks for the memory! @toemailer Sure! Just link it back to here!